Combine scallions, cilantro, lime juice, soy sauce, vinegar and ginger. Whisk in grapeseed oil. Season with salt and pepper. Rinse and dry fish well. Line a broiler rack with foil paper. Rub fish with 1 teaspoon olive oil and season with salt and pepper. Place on rack and pour wine over fish. Cook 12-13 minutes until internal temperature of fish reaches145 degrees and fish flakes easily. While fish is in the oven, trim ends of bok choy, wash and dry well. In a bowl whisk the veggie broth with cornstarch. In a large skillet, heat grapeseed oil. Add the garlic and cook over high heat, about 20 seconds. Add the bok choy and stir-fry until leaves start to wilt, about 1-2 minutes. Add the broth and stir until slightly thickened, about 2-3 minutes. Remove from pan, season with salt and pepper. 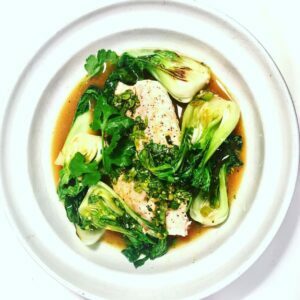 To assemble, Pour broth in shallow bowl, place fish and bok choy in bowl and top with cilantro sauce. Enjoy!